Turning Your Dog Into a Show Stopper: Ever Wondered How The Experts Do It? Whatever type of dog you own whether they’re a pedigree or a cross-breed made up of all manner of breeds you've had fun identifying, we all want our dogs to look and feel at their very best. A cold wet nose, bright eyes combined with a wagging tail and glistening coat are some of the telltale signs of a happy, healthy dog. Some breeds clearly require more attention in this department than others, but most potential dog owners will have taken into consideration the practicalities of a long-haired or double coated dog before buying. In this feature, K9 Magazine brings you expert advice on how to get your dog into show-stopping condition. If you are the proud owner of a Shih Tzu or any other breed of a long haired dog then a twice weekly combing of the coat is essential. Anything less will sooner or later result in your dog developing problems such as matting, which can lead to problems called hot-spots or even insect infestations. Any extensive matting which leads to felting of the fur may require shaving off. This must be done with great care, as the dog will probably be in discomfort already, maybe hiring a professional would be a wise choice. Breeds of dog which are prone to matting include St Bernard’s, Maltese, Pomeranian, Yorkshire Terrier, Collie and other similar breeds. Double coated dogs require a similar or larger amount of attention for the benefit of the household as well as the dog. Hair balls commonly develop on their fur and this can be a nightmare for the house-proud dog owner. It is also an irritation to the dog if he is developing hairballs. The process of malting in this type of dog begins at the haunches and progresses forwards along the body. Dogs with a soft, silky, short coat such as the Wheaten Terrier will benefit from grooming using a fine tooth comb. This is an effective way to groom but it is also a very good method of flea control. All dog owners will have the need for one of these implements at some point in the dog’s life. It is important to note that even short haired dogs are prone to some tangling around the ears. Effective grooming can be done at home. The best time to start, as with most owner/dog activities, is when he is still a puppy. This is useful for many reasons. It provides good interaction between you and your dog. Pack dogs groom each other and it comes naturally to any dog to groom itself, however, by grooming him yourself you are promoting subordination on his part, which is always conducive to a good relationship, particularly during puppyhood. The obvious advantage is that your dog will receive a healthy coat and should enjoy the whole experience. Bathing is another important element of grooming. It is very important though, not to bathe him too frequently as this can dry out a dog’s skin which can lead to skin irritation and could even see the dog shedding fur almost constantly. Specialist shampoos and gels are available too. They can enhance the condition of a dog’s skin and coat. Don’t rely on a shampoo alone in order for your dog to sport a shiny, glossy coat, as the condition of the dog’s coat is affected mostly by his diet and overall health. Bathing is also the ideal opportunity to inspect the overall health of your dog’s skin and coat. You can also use the experience to feel the dog for lumps and bumps or any breaks in the dog’s skin. New to Johnson’s award winning range, Manuka Honey 2-in-1 Shampoo & Conditioner is a premium shampoo, suitable for all animals including dogs, cats and small pets. Also it is ideal for use with horses to cleanse and condition coat and skin. The shampoo is formulated to provide soothing, cleansing, deodorising and conditioning of all types of coat, leaving it feeling soft, glossy, tangle-free and smelling fresh. Calming and soothing for pets with sensitive skin, its natural anti-bacterial qualities can help to alleviate skin problems caused by insect bites, flea infestation and dry skin conditions. It is particularly suitable for use with terriers and other breeds which may have greasy fur and skin. Johnson’s full range is exclusively available to the Pet Trade, from all Pet Stores, Superstores and Garden Centres. See the website for full details. If your dog receives proper grooming and has a healthy diet, yet has a poor coat, fatty acid supplements in his food might help. Thyroid problems often present themselves by way of a poor, dull coat and may be a possibility if your dog’s diet and grooming is not the cause. Consult your vet if you feel your dog’s condition is inexplicably subdued. The ears are a spot where fungi can thrive if given half a chance so regular inspections are a must as more serious problems can arise from ear infections. Droopy ears are particularly needy of constant attention. Products are available from the vet which can dry out the ear and reduce the risk of any infection occurring or spreading. Pay special attention to your dog’s paws. Dogs are susceptible to getting debris lodged between their pads which can be extremely painful for them and can lead to other problems such as infection if not addressed immediately. Trimming of the claws is important if your dog does not have the opportunity to keep them trimmed naturally by walking on concrete, roads etc (chewing their own claws is not an example of a dog keeping them trimmed naturally). Be warned, unlike ours, the dog’s toenails contain a nerve and a blood supply. So be careful if you are going to trim their paws yourself not to trim back the nail too far, or the dog could experience great pain and blood loss. If this does happen apply a small amount of corn starch to the end of the claw to stop the bleeding and take the dog to the vet. A good idea would be to ask a vet or groomer to trim their claws and watch how it is done. Also ask what equipment they used and where you can purchase it from. The last thing you want is a panicked, bleeding Great Dane running round your kitchen because you purchased a cheap pair of clippers from the supermarket! Grooming should be an enjoyable experience for both of you provided you have trained him to accept human contact and you are confident that you are not overstretching yourself in terms of grooming skills required – remember, professional dog groomers make a lot of things look easy but that’s down to training and experience. Basic grooming is not only simple, it’s extremely important that you provide it. Grooming offers a great chance for you to bond with dog and the result should be a happier, more handsome hound. We’ve covered the fundamentals but we all know how much we would love our dogs to glimmer, gleam and sparkle like the dogs we see on the TV at Crufts. Even if you own a dog of origins unknown, there’s no reason at all why they shouldn’t look pretty as a picture. So how do the professionals achieve THAT jaw-dropping, fantastic appearance of dog primed for the show ring? Well we went out and asked a couple of top groomers to reveal their secrets and here’s what they had to say…. 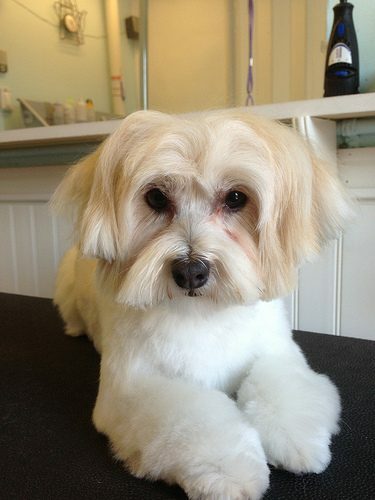 Barb Hoover is a professional dog groomer of 20 years experience. She owns Professional Pet Grooming in Leavenworth, Kansas USA. As a member of the National Dog Groomers Association of America, she is certified in the Terrier and Non-Sporting groups. Barb shares her house with 2 German Shepherd Dogs, a Long Hair Chihuahua, and 4 cats. 1) What are the basic principles for attaining the three main attributes associated with a happy, healthy dog – i.e. wet nose, wagging tail and a shiny coat? BH: A good healthy diet is the basis for a happy healthy dog. It’s the same for people. An area where many owners don’t pay much attention is their dog’s sleep patterns and sleeping arrangements. Imagine if you were subjected to odd or random sleep periods, you’d feel truly awful but for many dogs they either sleep too much or at irregular periods and this can cause a variety of problems. Simply being aware of your dog’s sleep requirements will help to ensure you afford them the opportunity to get into a solid routine – even if your own home life or family working hours are erratic. Stage 1. Dosing. The lightest form of canine snoozing. Stage 2. Scientists believe this is when the brain uses electrical activity to ensure the dog stays asleep. Older dogs for example do not show the same level of activity in stage 2 sleep and as a result many owners report their elderly dogs wake up a lot during the night. Stage 3. The dog starts to sleep soundly and the body stops moving. Stage 4. Deep sleep, REM sleep, here a lot of muscle motion is accompanied by rapid eye movement as they dart back and forth under closed eye lids. Unlike humans, dogs become fully conscious between sleep episodes and are able to go from deep sleep into jumping up and being fully awake within a split second. As anyone who has ever called out “walkies” to a sleeping dog will know, they can be wide awake a thousand times quicker than us mere homo sapiens! A dog that has not enjoyed enough REM sleep can become over reactive to quite mundane things and can generally feel under charged, as if their batteries are constantly trying to get back to full power. A dog needs its own resting “space” and, as much as possible, a sound routine where they know they will be allowed to sleep without being woken every other hour by any number of outside noises which you may not even know about. If your dog sleeps in your bedroom do you know if you are a ‘noisy’ sleeper? It may sound silly, but to a dog your midnight rambling may sound like you are calling out to them for help and they could spend half the night in a state of semi-readiness to come to your aid! You get a fantastic 9 hour’s slumber whilst your poor pal has been sleeping with one eye open all night worrying about you! Sleep; simply be aware of it and your dog’s need to be afforded the chance to establish a routine – especially true in convalescing dogs. A View from Thailand: What’s a Dog’s Life Worth?